XLS is for Excel 97- 2003. XLSX is for Excel that is newer than 2003. 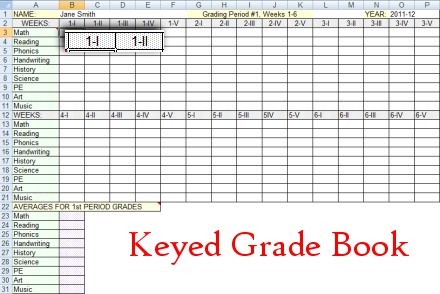 In the case of this particular grade book, keyed means that it has column and row names that coordinate with certain term planners. A key is a reference. The key connects the grade to the lesson plan. In Cell B1, change Jane Smith to your child's name. In Cells A3, A4, A5, A6, A7, A8, A9, A10, A11, enter up to nine subjects. To add a grade, find the cell in which the grade should go (if using keys) and type the number. The grade book is set up to accept numbers such as 90, 90.5, etc. -- Note the lack of %, do not enter percentages in this grade book. If you decide to print the grade book, be sure to check print preview first t make sure that page breaks at the end of a 6-week period. Currently the sheets are set up to print horizontally and each sheet will use 2 pieces of paper. The entire grade book uses at least 6 pages. This grade book is for one child for one year. The grade book is split up in 6-week periods, but also reports 1st and 2nd semester grades. Each subject has 180 cells. While this grade book is keyed, using keys is optional. If your planner is not keyed and you want to use keys, write the key in the planner after entering the grade in the grade book.